An average adult horse drinks at least 10 gallons of water each day. Through most of the year, it’s not too hard for a farm manager to ensure that each horse has access to sufficient water—just make sure to have clean buckets or troughs and fill ’em up. But in the winter, this normally mundane task becomes one of horsekeeping’s greatest challenges. Providing access to clean, unfrozen water is a top priority for horse owners during the winter. It’s important to note that a horse’s hefty water requirement doesn’t decrease just because the temperature does. Even though they aren’t losing water through sweating as they do in hot weather or heavy work, horses still need water to aid in digestion. In fact, because many horse owners wisely feed extra forage in the winter to help keep their horses warm, extra water is necessary to keep their digestive systems moving and reduce the risk of impaction colic. Here are some of the challenges of keeping horses hydrated during cold weather and how to work through them. 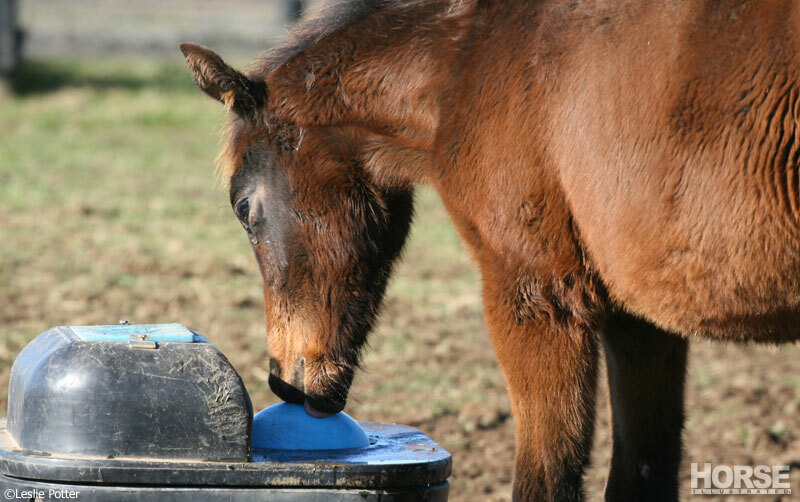 Without a doubt, keeping your horse’s water unfrozen is the top priority when it comes to keeping him hydrated. Once you’ve filled up his buckets, it can take only a few hours before a thick layer of ice has covered the top of the water. Some horses will break though a layer of ice to get to the water, but eventually it will become too solid to do so. The easiest solution for this requires an investment in bucket heaters. There are different types available. Some are heated buckets that plug right in and are ready to go. Others are meant to be submerged or floated in a trough. While these are quick and easy solutions for some horsekeeping situations, they require electricity and are therefore not always practical. You can break ice manually by hitting the side of the bucket with a rubber mallet (don’t use a hammer or other more solid tool as it could crack a frozen bucket.) Use a kitchen strainer to fish out as much of the ice as possible, or just dump the bucket and refill to ensure your horse has fresh water. Alternatively, you can add hot water when you refill the buckets. Many barns don’t have the luxury of hot running water, but you can bring it out from your house, or use an electric tea kettle to heat up water in the barn, then bring it out to the pasture. Finally, there are several varieties of automatic waterers that don’t require electricity and do provide a constant supply of fresh water, even in below-freezing temperatures (although they will need to be checked regularly in very cold weather to ensure they are still functioning properly.) This isn’t a quick fix, but it is a worthwhile investment to consider for the future. Even if your horse’s water is free of ice, he still may not want to drink it if it’s icy cold. 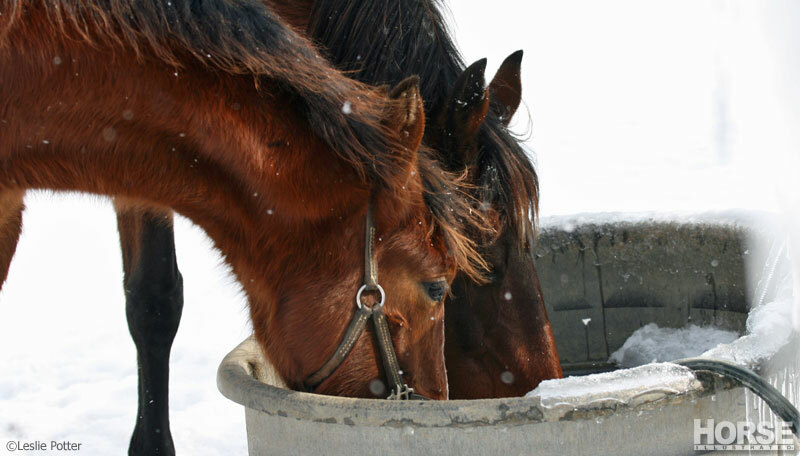 Research from the University of Pennsylvania found that horses drank as much as 40% more during cold weather when offered warm water compared with when they were provided water that was near-freezing. Scrubbing buckets in freezing temperatures isn’t much fun, but it’s essential to make sure that your horse has a clean water supply. Fortunately, changing out the water in your troughs and buckets frequently will serve the dual purpose of providing fresh water and slowing ice formation. Your horse can’t drink what he can’t access, so make sure that his water source is somewhere where it won’t be cut off. If your horse has to navigate down an icy hill or work his way through fallen branches after a storm, he may not be going to drink when he needs to. Some horses just don’t seem to want to drink in the winter, no matter what you do. Provide a salt lick for your horse in his stall or in the pasture. The salt will usually trigger a horse’s thirst and get him to start drinking. You can also add regular table salt to his grain if he’s not interested in a salt lick. Most horses like the taste, but watch to make sure that your horse is OK with it. Horses do the most drinking during or immediately after eating, and this works out well for their caretakers. 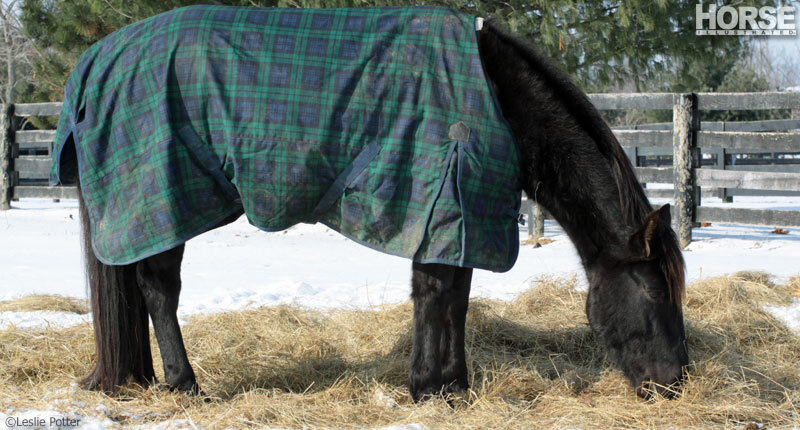 When throw your horse his hay, that’s the ideal time to make sure he has a clean, unfrozen water supply because he will probably be most inclined to drink over the next few hours. Horses need water do aid in digestion and typically will do most of their drinking within a few hours of eating. Feeding a mash is a time-honored tradition among horsepeople, but one with questionable benefits. A mash is usually made of either bran or a horse’s regular grain mixed with hot water to make a thick, soupy meal. One of the alleged benefits is that it gets more water into a horse’s system during cold weather, but the amount of water is not enough to compensate for a horse that isn’t drinking at all. There’s probably no harm in mixing your horse’s grain with hot water, but it’s no replacement for a real water source. Read more about the bran mashes in Feeding Bran. Preventing impaction colic due to dehydration should be at the forefront of every horse owner and manager’s mind during the cold season. Stay on top of these management practices, and you’ll have a healthy, hydrated horse all winter. Excellent article. My horses are boarded at a place where all water froze. How long can they survive this situation? Good info! I have to haul my water out to the horses in 5 gallon buckets, and when it’s cold out, I fill them with hot water from the house. I’m very thankful that my horses have no problem drinking icy water. They’ll even break the ice themselves if it’s not too thick.